When I was a kid growing up in New York, I dreamed of playing for the Yankees. Unlike many kids who shared that dream, I worked extra hard to turn my lofty goal into a reality. I played baseball year-round, went to camps, and even met some coaches and scouts who I thought would help me one day. And as a Christian, I had one more tool to help me achieve my goal: prayer. Since God loves to answer prayer—I was told—I had no doubts about my future. As I aged into my late teens, my prayers continued but the phone calls never came. I never grew those final inches, my throwing arm never matured, and my rotator cuff started to tear. My professional career in the Bronx simply wasn’t going to happen. To be blunt, it wasn’t going to happen anywhere. But since my dream was dressed in prayer, how could it fail? Was God unloving for not realizing the one dream I cared about? Was he too weak to grant a simple request to a good kid? Recently, I was told by a well-meaning Christian that God always answers yes to prayers whenever they are for “good things” like health, wealth, or success. When this friend said that, my mind shot back to my career not playing for the Yankees. Would playing baseball in the Bronx have been good? Oh yeah. Would keeping my shoulder intact have helped? Without a doubt. Would catching for pitchers like Andy Pettitte or Mariano Rivera brought me wealth? Okay, these are easy questions. So how could a loving God say no to my prayer that would have brought me such happiness? I have some answers, but they aren’t all warm and fuzzy. In fact, my well-meaning friend is not going to like the rest of this entry—you may not either. Hopefully, we’ll still be friends. Frankly, there are a lot of reasons God says no. 1. 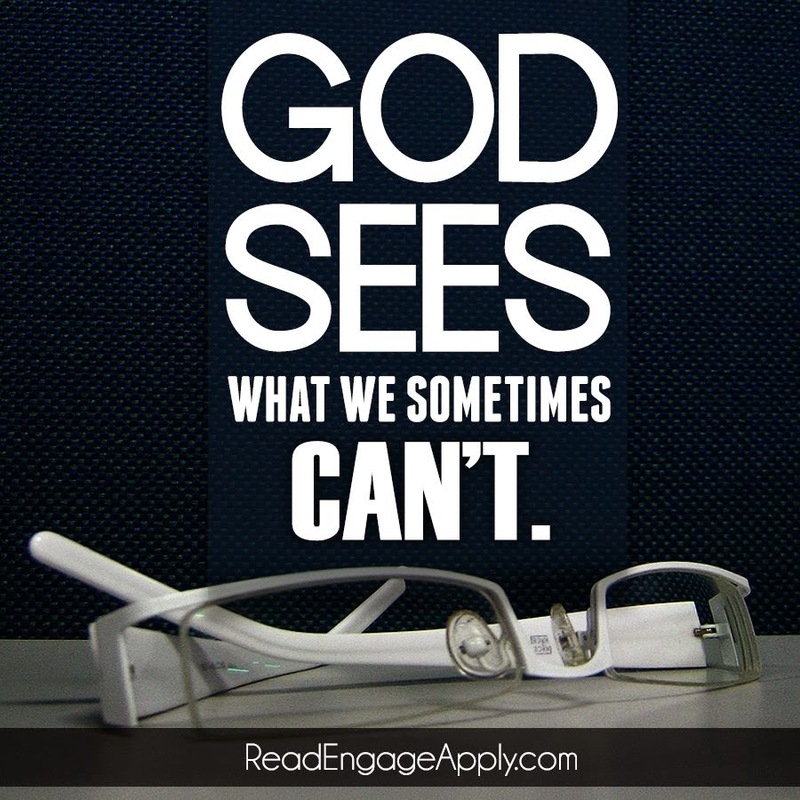 God says no because he sees the big picture. I didn’t make it to the Yankees because God had other plans for me (see Jeremiah 29:11). If I had a career in baseball, I would not have met my wife, had my amazing kids, and be involved in the church where I’ve served weekly for nearly 20 years. And who—besides God—could possibly know what the plan is for my son (or his great-great-great-grandson), who has a life because I didn’t play professional baseball. If I had been catching fastballs in New York, I would have missed out on God’s plan that he had prepared in advance for me: “We are God’s handiwork, created in Christ Jesus to do good works, which God prepared in advance for us to do” (Ephesians 2:10 niv). 2. 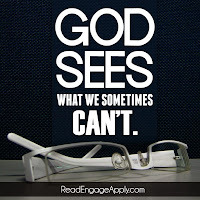 God says no because we are too shortsighted. Our prayers often revolve around what we want: money, a spouse, a better job, a long life. We focus on these external things. I think God might pay these things notice in the same way as I learned to appreciate my toddler’s interests, but his concerns are much greater: “The Lord does not look at the things people look at. People look at the outward appearance, but the Lord looks at the heart” (1 Samuel 16:7 niv). When my kids were toddlers, I learned to play their games and spend time with them at their level. But imagine what a terrible father I would have been if I did not have a bigger picture and purpose for my kids. Don’t misunderstand. I’m not calling prayers for a spouse or health trivial. But compared to God’s glorious plan, they do pale in importance. Like a child who has a limited view, we may not agree with God’s plan, but one day we’ll realize that God’s plan is bigger. 3. God says no because his primary concern is not my earthly happiness. I’m sorry. I did mean it that way. I serve a God who is bigger than I can ever imagine. He stands outside the timeline of humanity so that he can see all human history with just a glance (see 2 Peter 3:8). God’s goals are to demonstrate his love to earth (John 3:16), to reveal his glory (Isaiah 48:9–11), and to bring as many people to salvation as possible (2 Peter 3:9). Is it reasonable that someone’s poverty could cause the kingdom of God to advance (#MotherTeresa)? Is it possible that someone’s horrific suffering might bring others to faith (#CorrietenBoom)? Is it feasible that an awful, untimely death might lead to the salvation of thousands (#JimElliot)? God does not cause evil, but he is big enough to bring good out from it. If my spouse dies, is God uncaring? If I contract cancer, is God unfeeling? Not at all. God cares deeply as a good father would. But he can also see outside this moment of awful pain to a purpose we cannot understand. It is no accident that the above examples of Mother Teresa, Corrie ten Boom, and Jim Elliot are 30–50 years old, because sometimes it is only with the perspective of age and time that some of these senseless things begin to make sense. Does God always answer our prayers? Yes. Does he always answer them the way we want? Thank God, he loves us too much to do that. 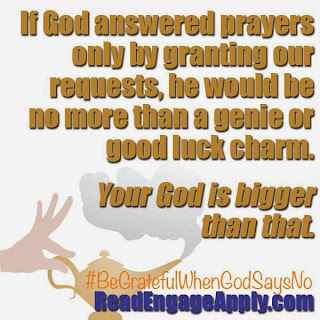 If God answered prayers only by granting our requests, he would be no more than a genie or good luck charm. Thank God, he is bigger than that. In future, Mr. Hudson, when you call me out, please use my name as a courtesy to me! This should start: Dear Donna, God wanted you to know....Thank you for this word! Even God's NOs are perfect! Be blessed! haha, Donna, I know what you mean. It's something that we can all relate to. What I love about God's word is that it speaks directly to us. Thanks for the comment! So true. It kind of scared me a few weeks back because my 24 year old son is in such mental turmoil .His uncle said "well, you know God knows who is going to make it because th a t was his plan" Now I am a christian and it still made me think...like I thought He wants to save...anyway I ended up praying and I still wonder a bit but I try casting those thought ..I will continue to believe for my son. Good article. I read the above and was thinking about my husband who broke his wrist whilst he was chasing a thief on his work place. So many of us prayed and we were trusting and believing that he would not have to be operated but behold GOD (papa) had other plans and so last week (26-3-2014) his wrist was operated and a metal strip had to be inserted as there was fragments when he broke his bone. Now he is one Medical and through it all I thank GOD for saving his life because the thief did not use a weapon to injure him, its only his wrist and thank GOD it happened during work and the medical is covered. Now I am praying that he will have favour from GOD and the employer as he is a shop assistant and is required to carry and arrange things on the shelf.